The Commission will send acknowledgement through SMS/email to candidates applying on-line, regarding successful completion of registration of on-line application. 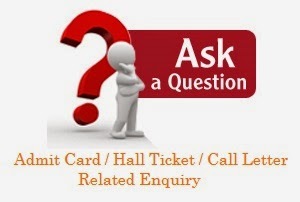 ☑ Admit card/ Hall Ticket Status : Available from 15-4-2015 to 15-5-2015. ☑ Download Recruitment notifications : F. No.3/1/2014–P&P-I (vol-II). The admit cards for PST/PET will be issued/ uploaded on their website by the CRPF, whereas the admit card for written examination will be issued/ uploaded on the website of the Regional Offices of SSC. Online applicants will download their admit cards for PET/ PST online only from CRPF website www.crpf.nic.in. Admit cards of only OFFLINE applicants will be sent through post, however they may also download the same from above mentioned website. Call Letters by post for PST/ PET, for OFFLINE candidates only, will be dispatched by CRPF from 15-4-2015. For ONLINE applicants call letters may be downloaded from CRPF website www.crpf.nic.in from 15-4-2015 to 15-5-2015. ➡ Take a printout of Admit card for the entering in exam hall. ✫ Candidates must carry at least one photo bearing IDENTITY PROOF such as Driving Licence, Voter Card, Aadhaar Card, Identity Card issued by University/College, Income Tax Pan Card in original to the examination center, failing which THEY SHALL NOT BE ALLOWED TO APPEAR FOR THE EXAMINATION. helpline Number 011 – 24364884, Extn. 436 and 317.